Just when Grumpy Grandad thinks that his garden is safe, he discovers that Maurice the Mole has been eating his delicious tomatoes. Grumpy Grandad is angry and wants to catch the pesky mole quickly. Maurice the mole has eaten so many tomatoes, however, that escape has become a problem. Can he get out of the fix and what will happen to Maurice? Every child has a fun story about something that has happened whilst at their grandparent’s house, Grandparents are very special, and to children, spending time with them is fun. This Grumpy Grandad series of fun books help children learn by using their imagination and encourage laugher and fun. Author Ann Twigg wrote these brilliantly funny stories to entertain her grandchildren and the children in her class at school. The inspiration for these stories happened when a naughty mole decided to dig in her garden. These are hilariously funny stories are a great way to help children to use their imagination and have them laughing out loud. This is a light-hearted audiobook that has been proven to captivate children. Ann used to hold the attention of young children with this story at the school where she worked for many years. 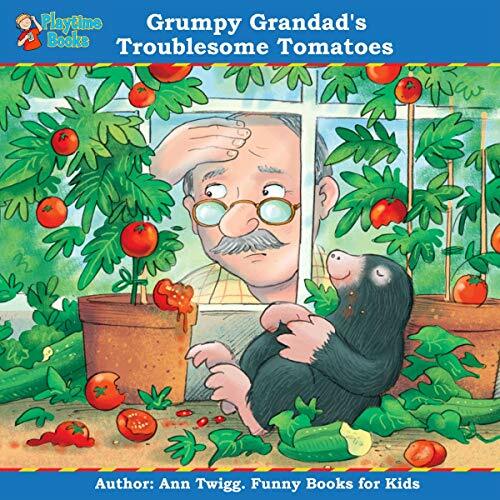 This is the second book in the Grumpy Grandad series, and Ann tells the story of when Maurice the Mole takes a liking to Grumpy Grandad’s delicious tomatoes. This funny audio story will have your child laughing along. My children loved this book. It reminded them of their grumpy grandad. Throughly enjoyed it.